Romanian mine sweeper Sub Lieutenant Alexandru Axentel heading to Northern Aegean for Nusret 2015 Exercise. This year the exercise will be held between 21 and 27 October 2015, in Saros Bay, northern Aegean. Turkish Navy will provide 14 warships, 6 planes and helicopters and one EOD team. Bulgarian, Romanian and Greek mine hunters/sweepers will also take part in the exercise. The Romanian participant is Musca class mine sweeper Sub Lieutenant Alexandru Axente. The Bulgarian participant is Briz class mine sweeper Shkval. I have no information about the Greek participant yet. 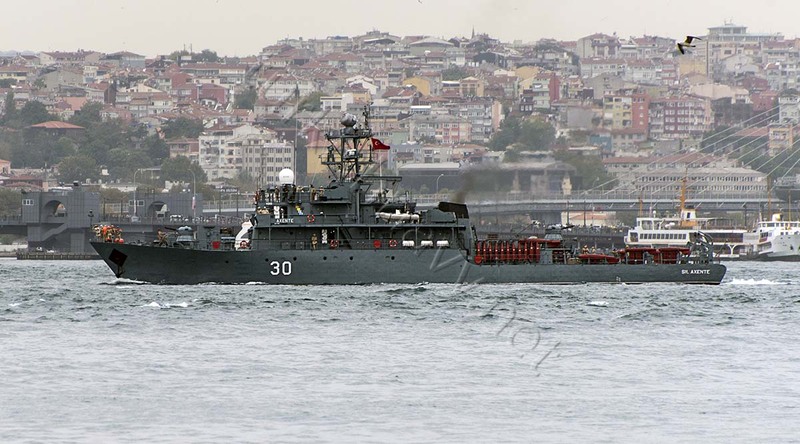 Bulgarian mine sweeper Shkval heading to Northern Aegean for Nusret 2015 Exercise. Photo: Yörük Işık. Used with permission. There will be EOD teams from Greece and Romania as well as an unmanned underwater vehicle team from US Navy taking part.